Moves by the Dubai government to inspire confidence in the once booming property market seem to have backfired. The recession has shown that Dubai’s growth was financed by billions of pounds of debt and this burden is threatening to drag the city under the desert sands. 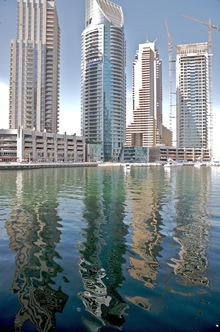 Several government-backed developers were at the forefront of major residential and commercial buildings in Dubai. Shares in the largest listed Arab developer Emaar Property had 10% wiped off their price on announcement of the merger with Dubai Properties, Sama Dubai and Tatweer. These three companies are all subsidiaries of Dubai Holdings, which has the backing of the Dubai royal family and analysts fear in the background assets are just being shuffled on paper to shore up ailing companies. The new company would have assets of £32 billion, according to Emaar chairman Mohammed Alabbar. 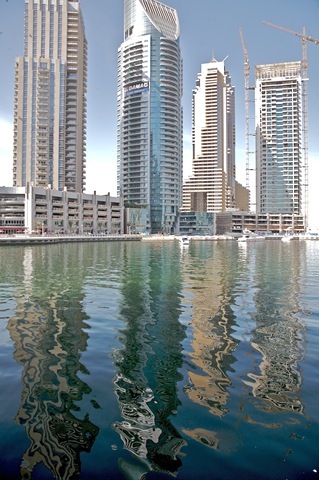 The problem is no one knows how far property prices have plunged in Dubai and whether they have hit the bottom yet. Dubai has already issued a $10 billion bond tranche to help the crisis hit economy, but still faces debt issues. The last official figures showed 40% was wiped off residential property values in the first few weeks of this year – and Alabbar confirmed his valuation of the assets was on figures for the end of 2008. The mergers smack of debt consolidation by using Emaar’s stronger balance sheet as security against the weaker financial positions of the other companies. The move has yielded mixed results for Emaar, with Standard & Poors (S&P) saying it revised its ratings for the firm to developing while Moody’s Investors Service, in a separate statement, said it placed Emaar on review for possible downgrade. Moody’s also downgraded Dubai Holding’s and placed it on review for further downgrade. S&P also downgraded credit ratings for port operator DP World, the Jebel Ali Free Zone and Dubai Multi Commodities Centre Authority, all of which had been on negative credit watch since April. “The rating actions reflect Standard & Poor’s reappraisal of the likelihood of extraordinary financial support by the Government of Dubai to government related entities to ensure the timely repayment of their financial obligations,” said S&P. The downgrades also “reflect our view of the stand-alone credit profiles of the entities, which in certain instances, we consider to have deteriorated,” said S&P. The agency added the reappraisal also was the result of “increased uncertainty regarding the government’s willingness to provide such support” to Nakheel, the property developer famed for building Dubai’s manmade islands. For property investors, the S&P and Moody’s downgrades are definite red light to putting any more cash in to Dubai until the storm has settled and the full extent of how much debt the government is carrying as a major shareholder in just about every business deal in the country. Investors should remember that all property market and financial data is historical and it may take a year or so for accounts and statistics to catch up with what is really happening on the ground in Dubai.